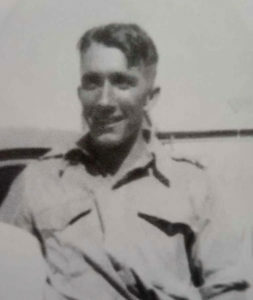 Epitaph, Singapore Memorial, Column 136, Age 23. John Stubbs was the youngest of 7 children born to Margaret Ada Bowe and William Stubbs who married in 1901 in Fremantle. There were 4 girls and 3 boys. 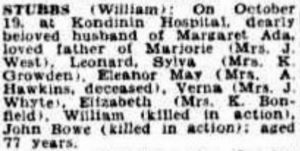 Brother William had enlisted with RAAF and was killed in aircraft accident 25 June 1942 Parkes, NSW. 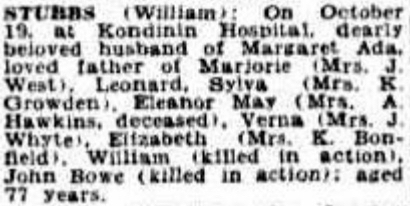 John’s father died in 1949.